Last year we shared Simone’s third birthday on Project Nursery, a colorful Doc McStuffins-inspired party, and we were so excited to see what the Guncles had in store for the birthday girl this year. 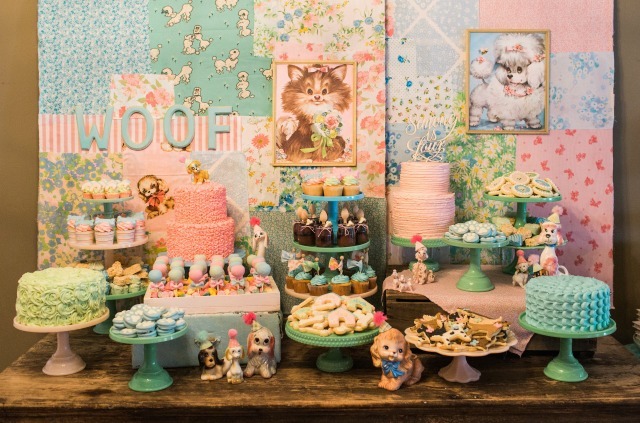 The four-year-old requested a dog-themed party, so her dads Bill Horn and Scout Masterson planned a sweet vintage puppy birthday party with help from Jenny Keller of Jenny Cookies. Guests included many family and friends, godmother Tori Spelling and her kids, Tiffani Thiessen with husband Brady Smith and their daughter Harper (Simone’s best friend), James and Kimberly Van Der Beek with daughter Olivia and Sarah Michelle Gellar and her children. The party decor was created with a mix of vintage and new. Scout and Jenny knew they wanted to incorporate the family’s elaborate collection of Martha Stewart by Mail milk glass cake plates in the colors jadeite, pink and blue. Over several months, Scout hunted down vintage fabrics and porcelain dog figurines. They also turned to party destination The TomKat Studio for an eclectic and vintage-inspired mix of decor, plates, printables and party essentials. The birthday girl was dressed in her mint green dress from Bel Bambini, and she was treated to a party manicure provided by Nail Garden. What’s a vintage puppy birthday party without a trip to the pet shop? Each guest took home his or her own stuffed pup complete with a Certificate of Adoption! In lieu of gifts, guests were asked to bring diapers and wipes for Baby Buggy, the family’s favorite charity. Guests indulged in a hot dog station and finished off the celebration with a trip to the show-stopping dessert table. Jenny used ingredients from GYGI, a baking supply shop, to create the puppy-inspired treats. cutest birthday Paw-ty idea ever! Oh my goodness. It turned out perfectly! Two questions…where did you get the adorable kids’ table and chairs? Rental? Purchase? Second question…did you repaint the area by the kids’ table/chairs? ADORABLE! Can I ask where the dog wall art prints came from?